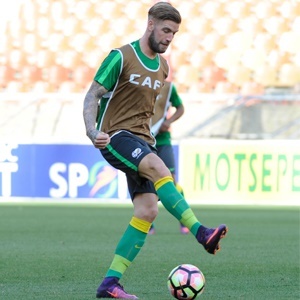 Cape Town - Bafana Bafana striker Lars Veldwijk believes his height can be an asset for the national team ahead of Sunday's clash with Libya in Tunisia. South Africa are set to take on the Mediterranean Knights in a massive 2019 Africa Cup of Nations (AFCON) Group E qualifier. The game takes place at the Stade Taieb Mhiri in Sfax, Tunisia with a kick-off time of 19:00 (SA time). Coach Stuart Baxter's side need a point to qualify for the competition in Egypt, whereas, the North Africans need a win to advance at South Africa's expense. Nigeria have already qualified for the AFCON in June and July as group winners whereas Seychelles finished bottom of the standings. Nonetheless, Veldwijk, who has scored 17 league goals for Sparta Rotterdam in the Dutch second tier, takes the view that his physical stature can be a strength in the contest. He told SAFA's official website: "I am a striker and all I want to do is score goals. "I think that my height will play a vital role for Bafana Bafana if I am tasked to play the number nine position against Libya or come off the bench to make an impact. "We have a very good squad here and all the players are very dedicated and true professionals. It is very nice for me to be back in the team and see some old, familiar and new faces."